Earth in the distant future, civilization is in ruins. Killy stumbles through a gigantic technology cemetery in search of the mysterious network genes, that gain access to a global communication and control network. He encounters scattered human communities struggling to survive in the fight over the scarce resources against cyborgs and silicon beings. Usually Killy tries not to put his mission at risk and keep out of these struggles, but the encounter with a little girl changes everything. 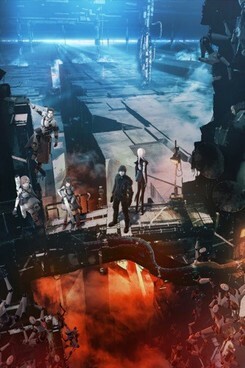 With the anime version of Cyber-Punk-Cult-Manga BLAME! from Tsutomu Nihei, Netflix leans on great classics of the genre like Ghost in the Shell, Bubble Gum Crysis or Ergo Proxy. Director Hiroyuki Seshita manages to set an absolutely equal work against these role models. The storyline with its taciturn hero Killy will remind fans of dystopian cinema of George Miller's great Mad Max series. Genre lovers can look forward to a densely staged post-apocalyptic epic, which unfolds to gloomy magnificence on the big screen. Blame! wurde auf dem 19. JFFH 2018 gezeigt.